EPRI is currently part of the consortium of contractors paid to operate the Idaho National Lab (IDL), too! The utility companies are paid to run a US National Lab! It’s already bad enough, and a terrible waste of money, that public labs are run by private contractors, but this is outrageous. At the dawn of the nuclear age, the private sector was allegedly hired, because the government lacked the expertise. That was over 70 years ago. The EPRI itself states that “almost all SNF being loaded in the U.S. is now high burnup. Since high burnup SNF has different mechanical properties than lower burnup SNF, industry needs additional data on high burnup SNF under typical conditions.” In other words, they don’t know much about high burn up fuel and are not certain that they can store it safely, and keep making it anyway! 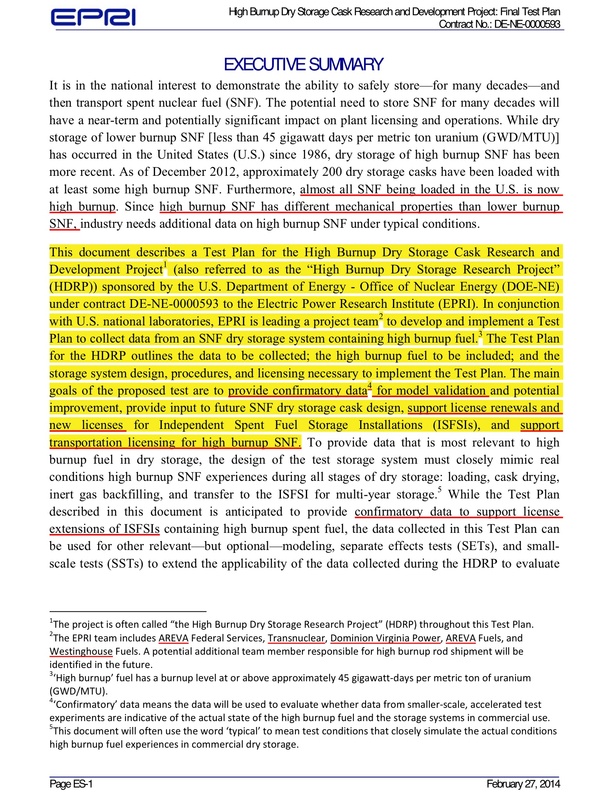 They elaborate in two footnotes: “The project is often called ‘the High Burnup Dry Storage Research Project; (HDRP) throughout this Test Plan. The EPRI team includes AREVA Federal Services, Transnuclear, Dominion Virginia Power, AREVA Fuels, and Westinghouse Fuels. A potential additional team member responsible for high burnup rod shipment will be identified in the future.” http://www.energy.gov/sites/prod/files/2014/03/f8/HBUDry%20StrgeCaskRDfinalDemoTestPlanRev9.PDF Westinghouse is Toshiba. Transnuclear is Areva. They state right up front that the purpose is to “provide confirmatory data for model validation and potential improvement, provide input to future SNF dry storage cask design, support license renewals and new licenses for Independent Spent Fuel Storage Installations (ISFSIs), and support transportation licensing for high burnup SNF.” http://www.energy.gov/sites/prod/files/2014/03/f8/HBUDry%20StrgeCaskRDfinalDemoTestPlanRev9.PDF The confirmatory data is supposed to be “to evaluate whether data from smaller‐scale, accelerated test experiments are indicative of the actual state of the high burnup fuel and the storage systems in commercial use.” Do they want to improve the model to find what they want to find? They also want to support license renewals, transport, etc. It is in their vested interest to find that everything is ok. We haven’t read this document, except several pages, but it is a brazen and dangerous conflict of interest for the US DOE to hire them. The US DOE is paid for by taxes. It’s time that people understood. This isn’t free money. It’s coming from hard-working Americans and making a mockery of them. That’s why so many hate the Federal government and taxes. And, AREVA has been under investigation for YEARS, in France, after having lost billions (of taxpayer money) in what has become known as the “Uramin scandal.” http://fr.wikipedia.org/wiki/UraMin The French Nuclear industry is subsidized already by the French taxpayer. Must it also be subsidized by the American taxpayer? Toshiba and Hitachi are also being subsidized by the Japanese government via the Fukushima clean-up: “Toshiba and Hitachi are, in effect, being paid to clean up their own nuclear mess. That’s right, these companies have now made money from Fukushima twice, first from building and maintaining reactors, and then again for cleaning up after those reactors failed. What an interesting business model.” http://www.greenpeace.org/international/en/news/Blogs/makingwaves/four-things-you-should-know-about-the-fukushi/blog/44098/ Currently Fukushima clean-up costs are mostly paid by the Japanese government. The Economist, Feb. 7, 2015, Asia edition, in “Fukushima Dai-ichi, Mission impossible, An industrial clean-up without precedent“, cites a figure as high as 50 trillion yen (approx. $ 427 billion), for the cost. Areva was also at Fukushima, having provided MOX fuel, for one of the reactors, and then an apparently failed water clean-up solution. The US approved spent nuclear fuel casks: BNG Fuel Solutions Corp. (now Energy Solutions), Transnuclear, Inc. (French State owned AREVA) Holtec International (private but apparently owned by Krishna Singh), NAC International (sold in 2013 by USEC to Hitz Holdings U.S.A. Inc., a subsidiary of Hitachi Zosen Corporation). http://www.nrc.gov/waste/spent-fuel-storage/designs.html Hence, the US taxpayer is also paying research and development for “EnergySolutions”, owned and run by former Goldman Sachs investment bankers, and whose water purification system at Fukushima has mostly failed for years, although they are still there. EPRI was founded in 1973, apparently in response to mounting public resistance to rate increases and new nuclear power plants, and to find ways to decrease costs. It’s first budget was $50 million of ratepayers’ money. The current Chairman of the Board for EPRI is the CEO of Exelon utilities. Exelon owns and/or operates 23 nuclear reactors in the US, and was a major campaign donor for President Obama. The EPRI Board has representatives from EDF (Electricity of France) Areva’s French State owned nuclear twin; Duke Energy, which owns and/or operates many nuclear power stations, Southern, which is building new nuclear reactors at Vogtle and which got a 6,5 million $ loan guarantee from the US DOE. There are many other utilities represented on the board. EPRI used to have a TEPCO member and Entergy. Wonder why they don’t have TEPCO on the board anymore? The kicker, of course, is that the US and Japanese governments will most likely do another bail out for nuclear companies when the next accident occurs in the US or Japan due to their new suicide pact called the “Convention on Supplementary Compensation for Nuclear Damage”, which, on the US end, uses the Price-Anderson, which is supposed to be paid, after the accident, by the utilities, and additional insurance, which is supposed to be paid, after the accident, by the service providers as a group. Unless you are very young you know that this will translate into bankruptcies and bail-outs, and fall on the backs of the taxpayer. For Price-Anderson it may fall on the backs of the ratepayer. And, it encourages the selling of defective nuclear equipment (fuel rods, etc. ), because the culprit cannot be held fully accountable. There are, of course, other members of this suicide pact who will pay less, because they have less nuclear power. We wait to see if India will be foolish enough to join, which will make Japan, the US, and to a lesser degree Romania, Argentina, and eventually Morocco and the UAE liable for a defective Russian built nuclear power station, as well as the rest. The only funny part is that the research-experimentation is being done at the North Anna Nuclear Generating Station. Chickens risk coming home to roost. 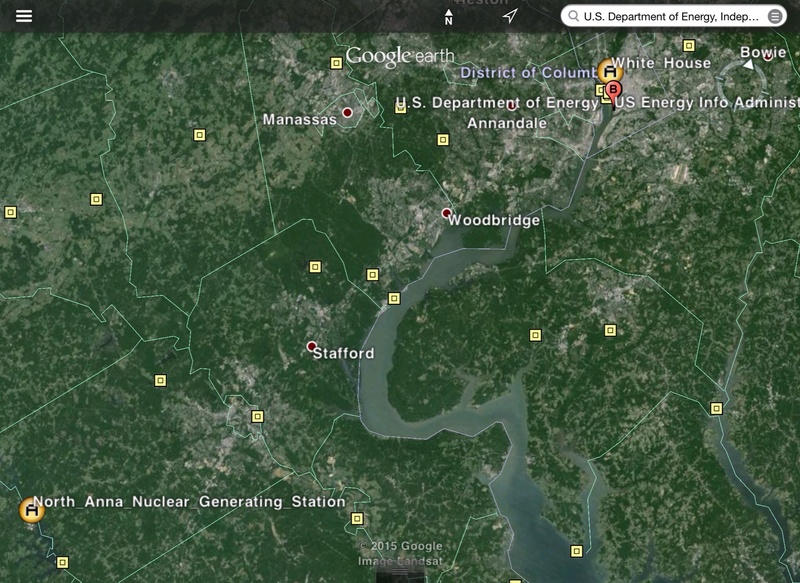 You can be certain that the NRC is nearby as well. Congress is nearby. It suggests they are on some strange drugs. Or, is it just the power trip? Why even bother to chase people off the White House lawn? Unfortunately, whether in daily nuclear operations, or in the event of accident, it rains radiation on the just and unjust alike. Nuclear energy is nuclear war everyday. One day it will be too late. 2015 is the year to stop the nuclear industry, before it stops you! Even though the 1986 and 1987 studies were paid for by the US taxpayer, EPRI appears to claim copyright to them, which is wrong. See: “The Sun betrayed: a report on the corporate seizure of U.S. solar energy development” by Ray Reece. South End Press, Boston, 1979. (p. 36-37; p. 146). This book appears to be the most important work written about the EPRI. It also explains how EPRI favored solar and wind power which was “amenable to centralized operation and control” (p. 146). By now, that concern comes through clearly even in Reuters news – the utilities fear losing centralized monopoly control. And, that is clearly one reason they favor nuclear. Nuclear is the epitome of centralized control – except of course the nuclear waste, which they are increasingly trying to dustbin and bury. To find current EPRI Board members search for EPRI Board in Google. It’s not easy to find directly on the site.